You can create and run the slide show right on your Canon Rebel T6i/750D camera. You can even add some transition effects if you choose. And by connecting your camera to a TV, you can display your best photos and movies to the whole roomful of people. Display Playback Menu 2 and choose Slide Show, as shown on the left. Choose Slide Show and then either start it or customize different aspects. You see the screen shown on the right. The thumbnail shows the first image that will appear in the slide show. Should you change the selection criteria, the image will automatically update to show you the first file that will appear in the show. Also on this screen, you see the total number of images (again, still or movies) slated for inclusion in the show. On your first trip to this menu screen, all images on the card are selected for the show. Tap the Select Files option or use the cross keys to navigate to the selection criteria box (shown on the left in the following figure) and press Set. The option box becomes active and is shown with up and down arrows, as shown on the right. Use this option to select the criteria you want to use to specify which photos or movies are included in the slide show. Press the up or down cross keys to specify which files to include in your show. All Images: Includes all files, regardless of whether they’re still photos or movies. Date: Plays pictures or movies taken on a single date. As soon as you select the option, the Info label underneath the option box turns white, clueing you in to the fact that you can press the Info button to display a screen listing all the shooting dates on the memory card. Again, press the up or down cross keys to select a date and then press Set to exit the date list. Folder: Includes still photos and movies in the selected folder. Again, press Info to display a list of folders and highlight the one you want to use, and then press Set to exit the folder list. Stills: Includes only still photos. Rating: Selects photos and movies based on their rating. Press Info to display a screen where you can specify the rating that qualifies a file for inclusion and to see how many files have that rating. After selecting the rating, press Set to exit the rating screen. Press the Set button to deactivate the Select Files box. Next, choose the Set Up option. Use these four options to ­specify your playback preferences. Display Time: Determines how long each still photo appears on the screen. 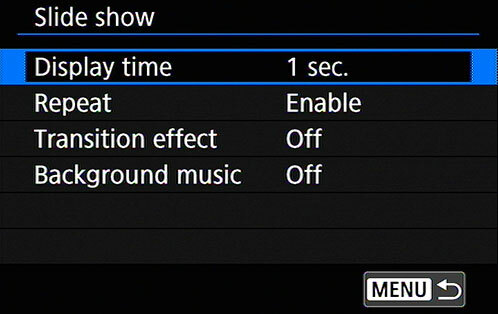 You can choose timing settings ranging from 1 to 20 seconds. Movies, however, are always played in their entirety. Repeat: Set this option to Enable if you want the show to play over and over until you decide you’ve had enough. Choose Disable to play the show only once. Transition Effect: You can enable one of five transition effects. With Slide in 1, photos push their way onto the screen from the right. With Slide in 2, they slide in randomly from one of the four sides. With Fade 1, photos fade in as if placed atop the previous slide; with Fade 2, one slide fades to black and then the next slide fades into view (which happens quickly). Fade 3 slides the photos (or movies) in from one of the four sides and fades it into view as in Fade 1. Choose Off if you don’t want any effects between slides. Background Music: You can register and upload background music onto your camera’s memory card to play during the slide show using EOS Utility. MP3s aren’t compatible. The audio must be 48‐kHz, 16‐bit, stereo, linear‐PCM, WAV format, which you won’t have or easily be able to convert to unless you’re an audio‐­engineer geek like Robert. In lieu of using your own, Canon provides a small handful of samples when you install the EOS Utility. Please consult the EOS Utility manual that’s on the CD that ships with your camera. After selecting your playback options, tap Menu or press the Menu button to return to the main Slide Show screen. Refer to the screen on the left. Tap Start or highlight it and press Set. Your slide show begins playing. Pause playback. Press the Set button or tap onscreen. While the show is paused, you can press the right or left cross key to view the next or previous photo. Press Set again or tap the onscreen Set icon to continue playback from the current slide. Change the information display style. Press the Info button. Adjust sound volume (for movies). Rotate the Main dial. Exit the slide show. To exit the Slide Show, press the Menu button, or, if the show is paused, tap the Menu icon. To return to normal playback mode, press the Playback button.